The TriggerPoint GRID Ball™ brings together the signature GRID pattern with a 5-inch massage ball, for targeted relief in a compact size. Includes 1 Grid Vibe (Orange only) - which is designed to fit inside the Original Grid, and 1 Original Grid (select Colour before adding to cart). The MB1 massage ball provides direct deep tissue compression for fast relief of aches, pains and muscle fatigue. Designed to replicate the pressure a massage therapist's hand, the MB1 is ideal for targeting small muscles such as calves, piriformis and pecs. Unlock twice the relief with the MB2 Roller. Designed with two settings to ease tight muscles and stiffness in the neck and back, the MB2 can support proper posture and upper back mobility. The STK Sleek handheld massage stick compresses and rolls across muscles to improve flexibility and optimize movement. The flexible STK Contour massage stick wraps around and compresses muscles while rolling to increase circulation, speed up recovery and improve mobility. 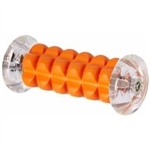 Trigger Point Core Roller, Grey, 18"
The TriggerPoint CORE Roller is the ideal foam roller for anyone that is new to foam rolling, prefers softer compression, or may be recovering from an injury. The high density EVA foam delivers moderate compression, for a comfortable total body massage. 18 x 5.5 inches. The new GRID VIBE vibrating foam roller relaxes tight muscles, improves flexibility, relieves pain, and elevates your recovery in a one-two punch of foam rolling and vibration. 12 x 3.5 inches. May also be used inside the Original Grid Foam Roller. Improving muscular integrity through the areas described in this book can ultimately enhance both comfort and performance. The Total Body Booklet is an instructional guide containing visual reference on how to perform the 12 manipulations covered in the Total Body DVDs. The design consists of easy-to-follow instructions that focus on the most important details that will enable you to get the most out of self-massage process. This sleeve is designed to house two TP Massage Balls next to one another, in a peanut shape, reaching either side of the spine, upper back and other targeted areas, with a controlled and even-movement. The Performance Therapy for Hip & Lower Back DVD includes two sections- the first is a How-To Session which includes an in-depth explanation for performing Myofascial Compression Techniques (MCT) on the soleus, soleus-calf junction, quads, inner quad, psoas and piriformis. The GRID X foam roller is Trigger Points firmest foam roller. It was created to break through the bodys toughest, tightest trouble spots for relief from intense aches and pains. Dimensions: 5.5 x 13 inches. SMRT-CORE exercises incorporate applied movements into foundation exercises, help engage your core and create a starting point for increasing strength and stability. 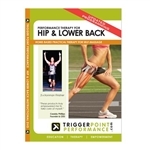 Includes the Total Body DVD and the Total Body Guidebook by Trigger Point Performance. The Trigger Point Grid 2.0 Foam Roller raises the bar on the traditional foam roller. Find the perfect Grid spot and go to work on your IT Band, quads, calves or any other muscle group that is troubling you. Dimensions: 5 x 26 inches.